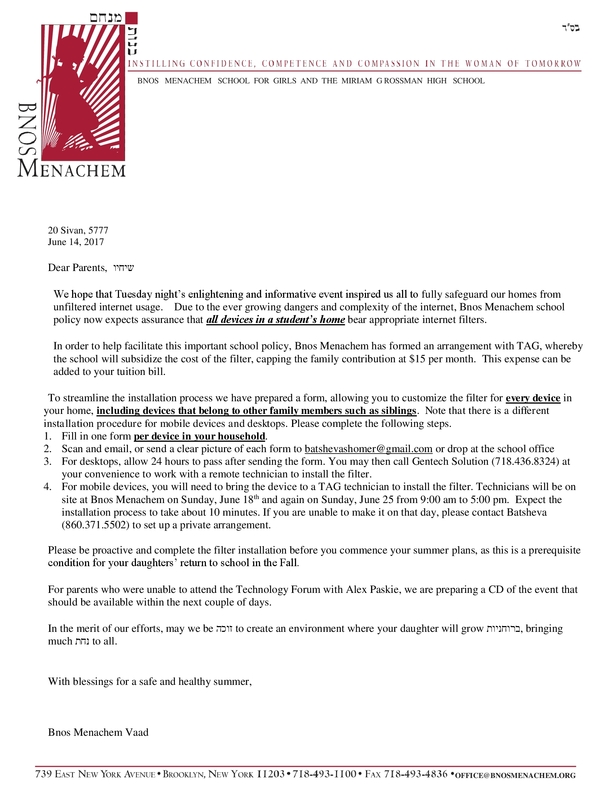 Crown Heights Girls’ School Bnos Menachem has sent out another letter to its parent body ahead of the upcoming school year, this time instructing them that all devices at home capable of connecting to the internet must have filters installed on them. 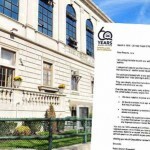 The letter comes after a meeting was held at the school to address the issue, at which at least one parent of each student was required to attend. The filter is a requirement for every device in the home, the letter emphasizes, including devices that belong to other family members such as siblings. “Installation of the filters is “a prerequisite condition for your daughters’ return to school in the fall,” the letter says. In order to help facilitate this new school policy, Bnos Menachem has formed an arrangement whereby the school will subsidize the cost of the filter, capping the family contribution at $15 per month. 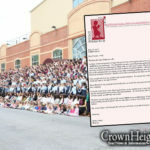 Earlier this month, the school made national headlines after it sent a letter to all parents requiring mothers to abide by enhanced modesty rules that include: not wearing dark nail polish, no denim, no long shaitels, no tight-fitting clothing, no leggings, no elbows; feet or neckline showing, and only mid-calf skirts. How will they enforce this one? Sniffer dogs to check out cell phones? Surveillance through the kitchen window? This is getting ridiculous. It doesn’t matter whether or not the individual agrees with filters or wants them… it’s the idea that BM is dictating every aspect of their students AND their families’ lives. When will it end? With a fancy building & no students? Totally, absolutely unequivocally a dictatorship, not a school. I can’t imagine what their next rule will be. Personally, I think filters are excellent & recommended, but nobody gets to tell me I must have them. If I had a girl in the school I’d be enrolling her somewhere else. It’s like holding sand. The tighter you grasp your hand around it, the more sand falls out. Holding your hand open, cup shaped, fingers closed, ready to accept allows the fewest sand grains to slip out. Basic science. Logic. It appears to be inviting a system shut down. Not only will the students be turned off, parents may be as well. Well, that’s the nature of suffocation. You lose many that way. Separate note: I’m grateful I’m not this Rabbi’s child. 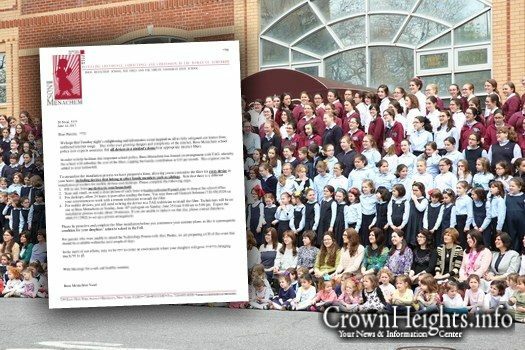 Check out the top schools in any Ultra orthodox community. All of them insist on filters. Unfortunately there is a growing crowd of modern orthodox or conservaform members of this community, who have no love of Torah, and they will allow anything to be seen on their devices, because they allow everything to be seen on their bodies. I’m not part of school but not getting my act together to do it. Can you offer this for community as well ? Happy to hear they have a vaad. Anyone know how many members and who is on this vaad? Why is every letter that a school is giving out to their students being posted online ??? Who cares let them do what they want , if u don’t like it don’t go to their school enough already why is this the biggest news ???!!!???? What’s the obsession with Bnos Menachem? It sounds like CNN with Trump. Boruch Hashem we’re catching up to rest of the Frum world. If all of the crown heights schools adopt these standards. Then the girls from families that don’t adopt these standards will have to go to non-chabad schools outside the neighborhood. Yes. And they will stop corrupting our children. If you don’t want to be frum, send your kids to public schools. They are free. Spoken like a true non chabad person..
Who do you think you are to decide who goes to school and who does not? My parents took care of the chabad schools in CH for years.. long before you decide to move to crown heights. Finally a school that it taking the Bull by it’s horn. Is that news? who cares what Bnos Menahem do?. glad my daughter got rejected. otherwise i would have to take her out now. It’s very interesting, that this letter was signed by the “BM Vaad”, even if it’s in, name only. Something was indeed learned, last time. Why are you posting all your new regulations online???? Trying to turn everyone else off so your next year registration will be as few as possible? Bnos menachem is subsidizing every family in their school getting filters on all their devices according to the needs of each person. Anyone who was there last Sunday had filters put on according to their own needs. None of us want our kids on bad sites or chat sites. One wrong click and we could be on them as well. Thank you Bnos menachem!!! This is a very expensive endeavor and we appreciate it! EVERY single family has been negatively affected by the internet- whether you know it or not! And if you don’t , it would be very beneficial for your family to get connected with TAG. Face it; it’s a problem that will either take you over if you don’t take care of it- even IF no one is looking at anything wrong , the time spent on it is a huge distraction to what should be the real focus in your life- children, marriages, family life etc. I find it amazing that BM took this initiative on to realize the issue and help the families get control over it B4 it controls us (as it does control all of us…admit it!). May this hachlata purify our homes and bring in the goodness. All I have to say is speak for yourself! Thank you Bnos Menachem. Bnos menachem is leading the way when everyone else is scared to open their mouths. Great school. It’s been done in most frum schools and yeshivas for years! Hatzlocho Rabo! May we see all other mosdois taking the same measures! what is next? which hechsherim you are allowed to eat? which restaurants you are allowed to eat in? which wine and mashke you are allowed to drink? which board games your children can play? this sounds like communism to me. Finally! Like all other frum schools! Anyone who makes a fuss is guilty or in denial…. Will the filter still let me get the Menus at Izzy’s and Beuf and Bun? Who is this TAG and how much are they making from this ridiculous exercise. I bet my teenagers know more about filters and how to manipulate them. I can just imagine the girls competing over who gets around the filets first. Don’t underestimate our girls. Nothing new. There are several Yeshiva’s in Flatbush that do this. It’s sad that it’s even needed. But until that happens to everyone, computer filters are necessary. It is a rule in all frum schools (or most). Nothing new. Lubavitch is not a free for all. Velo sosuru applies to us as well. Just because we go out of our daled amos on mivtzoim doesn’t mean that the street can home with us and occupy our minds and souls. Gurary,run away from him now ,don’t wait, your child will suffer ,he will be examining your bedroom next ,be very wary of these overly “religious”people ,they tend to get caught in their own web eventually.heaven help us now. Why are you people so upset, or gloating about Bnos Menahem customs? It is just a school. There are thousands of them. if the rabbonim do not care or do anything with takonas in our neighborhood, BH someone is. Why is CH considered by the FRUM world as modern? Let us try. Let us at least let the kids and many parents know that there is a standard (or should be) by true Lubavitch, not “Lubavitch Light” or any of the young adults who move here because “it is a happening” place. Time for us to take back our neighborhood!!!!!!!!!!!!!!!! If parents are not capable to watch their kids and want to be tznius, then their frumkeit is missing also. Any kid I know is capable of getting around any filter.. Something is really wrong in CH. A rule that is impossible to be informed is an impossible rule. Really glad we support another school. If you have kids that are trying to circumvent content restrictions then you have to pull internet out of your home, much as you would rid the house from mashke if you had an alcoholic family member (r”l). Filtering is there for those who want to to do right and who aren’t already sick. There are those who do not need these restrictions because they’ve been filtering for years, there are those who will gain nothing from these restrictions because they aren’t interested and will not comply, and then there are the majority who recognize this is an issue but rely on that the situation in their home is not now bad and that they do keep an eye out and that their kids do not have their own devices and that the only internet enabled devices are password protected and in the public area of their tiny living quarters and just don’t make establishing protections against what may come down the line in the future G-d forbid because of the technical challenge or laziness. That’s where this type of policy makes its impact. Personally, I’ve been filtering the internet for year. I use a router/end point based solution as opposed to a program that needs to be installed on every bloody device. I do hope that Bnos Menachem will not insist on their particular method of protection to exlusion of all others, which may be even better. Why this is the business of the community? I’m sure every parent of a child who attends BM, and their child enrolled in benos Menachem were made aware of this new rule. As so many have said, they are a private school and can enforce new rules as they please. But why is this being posted here? If this was for the purpose of inspiring others to join TAG, the article should have been a little more clear on that. Instead of explaining the Benos Menachem rule, it could have been a nice article explaining the harm of unfiltered internet and the benefit of tag. Beis Chaya Mushka enforced this rule as this past school year began. No article needed. No uproar. Just a rule which did a lot of good. I do’nt see why this is so awful. using a kosher filter, they hve use of the phone and it keeps them from wandering. Its like putting a fence around your house to keep the children from wandering out. what is the huge controversy? I know it seems like its control, but its really just to help. As other people said, it just helps keep the kids from ending up in inappropriate situations, etc. I can’t imagine why that is such an insult…. CH families have TV. He is living in the stone age. Boruch hashem we live in a free country with a free market and competition. If one school’s values aren’t aligned with yours, you have full permission to move to a school that is more aligned with your values. Nobody can cause you any harm for doing so. I really don’t see the issue here from the perspective of parent of children in the school. The school has the responsibility to make sure that our daughters are given the proper education. WE SHOULD BE ASHAMED OF HOW WOMEN IN CROWN HEIGHTS DRESS, THIS IS DEFINITELY WHAT THE REBBE WANTED. This school is overstepping it’s responsibility. There is no question about it. You might say they are only trying to do good, but it’s no more than spiritual extortion. Using their hold on the children to control their parent body. Schools are tasked with educating the children and are responsible for that education within their facilities. If they want to enact change within the community they should start a non affiliated organization to address those issues. I want to know how much the school is getting in kickbacks.